Enter stage left Boogie Bug, created at the turn of the century and dedicated to PC Tuning. We need to admit not always thinking of them when kitting out our rigs, we hope to make amends today. Their website states “When gamers talk to gamers” which if true, can never be a bad thing. We inferred in the Storm RX Gaming Surface review, that even Cooler Master could be a faceless corporation when it comes to what gamers want. We are not entirely sure we can claim the same for Boogie Bug, who seem to be aimed clearly at gamers, something fundamental to their journey. 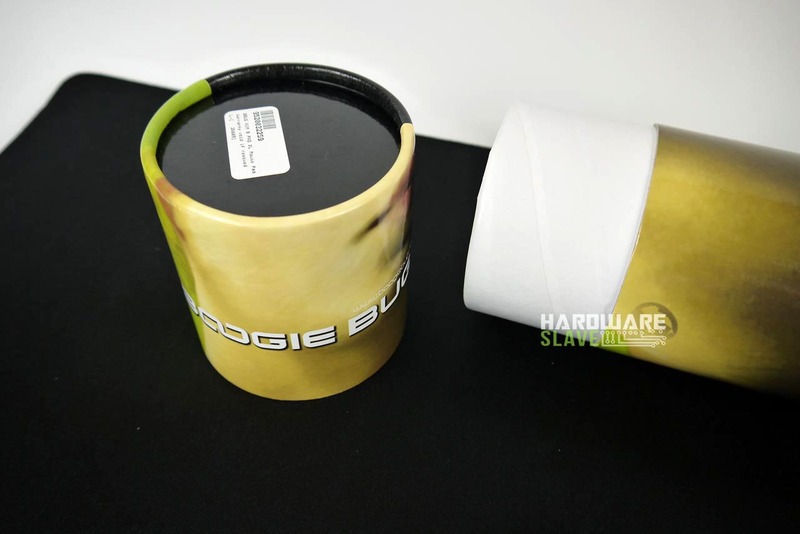 Today we put this to the test with the Boogie Bug Aim B.PAD XL Mouse Mat, with a small twist. Made with flexible textile material, the AIMB.PAD mouse mat can be rolled up, folded up and easily transported wherever you want. The AIMB.PAD was especially designed for the Gamers and all users looking for optimal precision and sliding. The twist is that it’s massive, 450mm x 900mm, and at under a British tenner, it’s probably one of the best value products we have ever seen, but we don’t think this is a budget product, let’s find out. The surface comes packaged in a large cardboard tube that could almost accommodate A2 paper rolled up which is also pretty sturdy. Inside we find the massive surface itself and a wrist sweat band, which we initially thought was a bit weird, but for the avid gamer, may just be a perfect addition to the collection of gaming things! No instructions but this seems to be norm for the modern gaming surface. We always suggest that some care instructions should be included, though usage instructions may be a little irrelevant. Overall we are impressed!